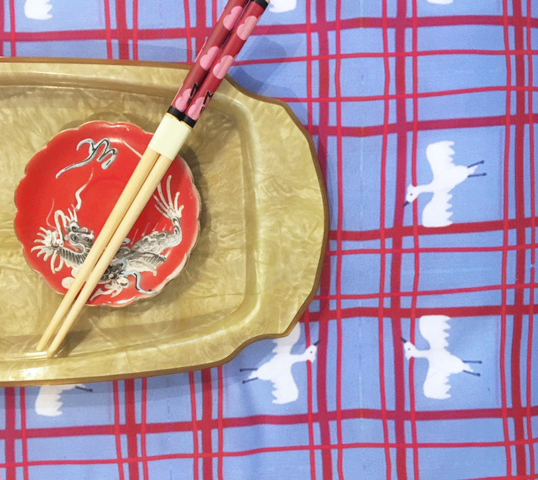 How to Make Your Own Japanese Tengui Inspired Tablerunner - Genue DIYGenue Inc. This month at Genue, we’re inspired by the limitless possibilities of the traditional Japanese ‘tengui’ cloth. While this timeless fabric can be decorated with any sort of motif or pattern, we took inspiration from the geometric design often found in traditional Japanese architecture, and the elegant white crane. 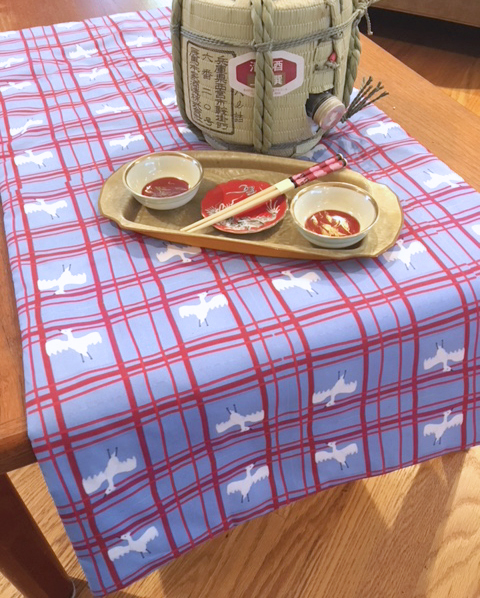 Follow along with us from start to finish as we draw our pattern, print our fabric, and sew a simple tablerunner that can be enjoyed at all sorts of events! Begin your pattern by picking out a color scheme. 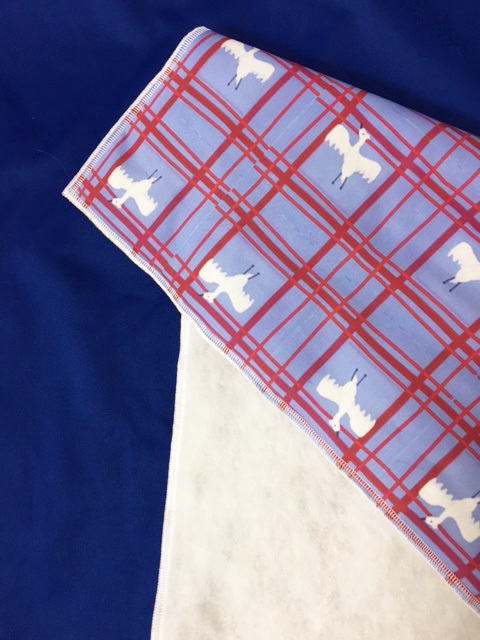 This month, our background color is a sky blue, with geometric lines in shades of red, and our crane drawn using shades of white and grey. So now, let’s start our design by choosing the background color. 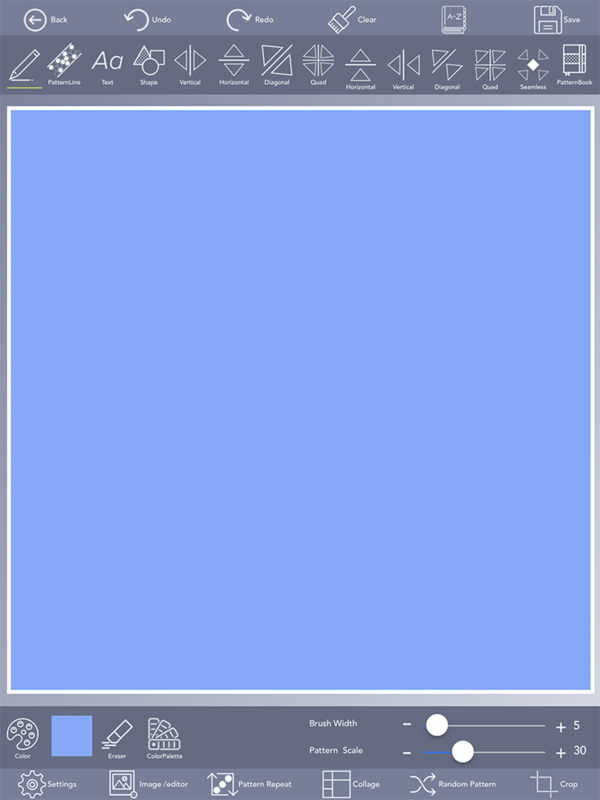 Hit the ‘color’ button and choose a light blue color of your choice—be sure to check that the ‘background color’ button at the top of the window is highlighted before exiting. This will fill your canvas with your chosen color! Next, let’s draw some lines that will create our geometric striped pattern! Use the ‘Color’ window to choose a dark red color that you like, and then use the slider bar in the bottom right corner of the screen to adjust your brush width to around 30-33 pixels wide. 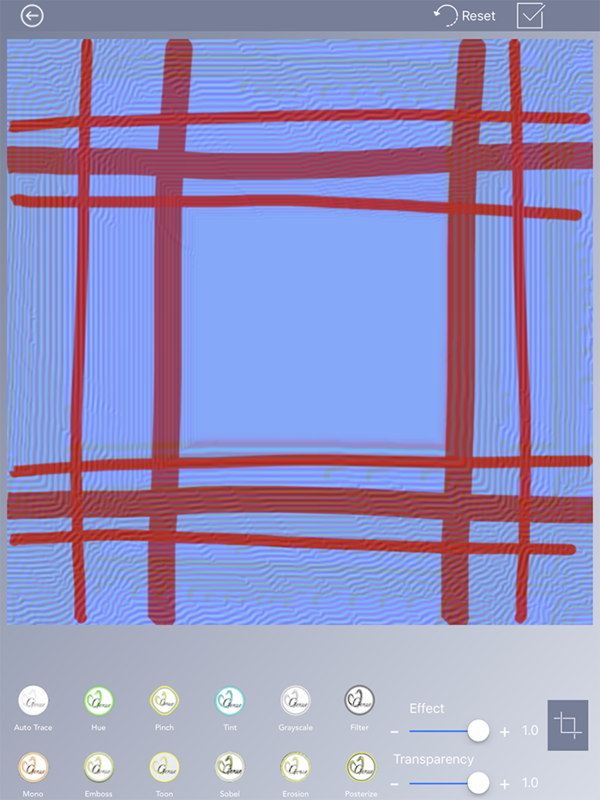 Using the ‘Vertical Mirror’ tool, that can be found near the top of the screen, draw a straight line downwards across the entire length of the canvas. You’ll notice that this tool mirrors your marks on the other side of the canvas! Now let’s switch to the ‘Horizontal Mirror’ tool to draw a horizontal line across the canvas in the same color. 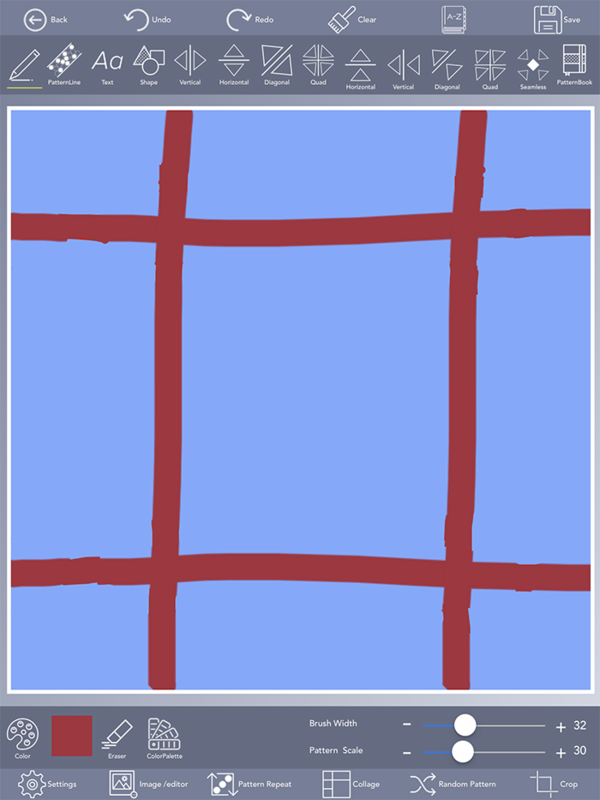 You should be left with a grid-like pattern, as seen below. If you’re at all confused by this process, feel free to watch our video tutorial on how we drew our grid! Now it’s time to add a filter effect to our pattern so far! To do this, let’s first save our pattern to our device’s gallery. Press the ‘Save’ button and choose the option to save to your gallery. Press the arrow in the top left side of the screen to go back to the canvas, and then press the ‘Image/Editor’ button. This will allow you to access the camera and gallery on your device. Select the ‘Gallery’ option, and open the image of your pattern that you just saved. New options will appear at the bottom of the screen—press the ‘FX’ button to access the filter effects. This will bring you to a new window where all of the filters are listed, along with slider bars to control the effect and transparency of the filters. For this project, we’ll be using the Emboss filter. Press the ‘Emboss’ filter button and then use the slider bars to adjust the effect and transparency of the effect—we suggest adjusting the effect to about 0.7-0.8, and the transparency to 0.3-0.4. 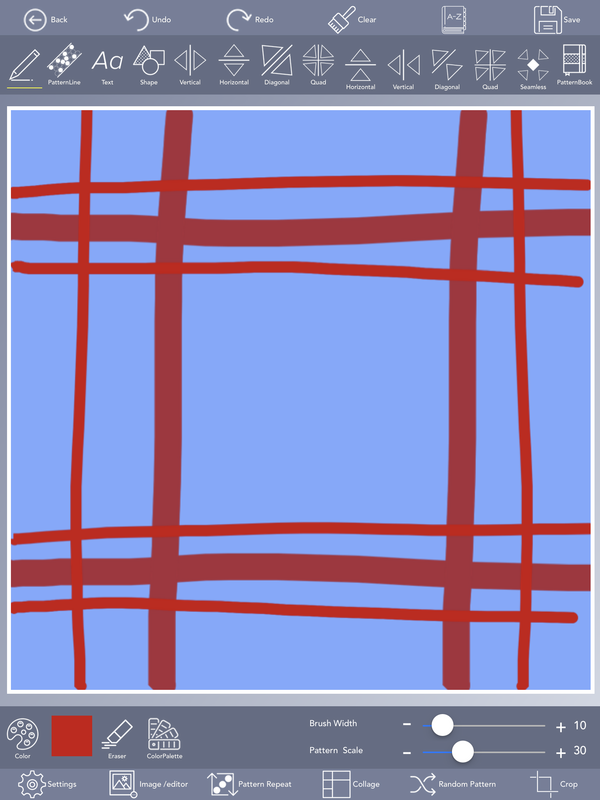 Press the checkmark button in the top right of the screen when satisfied, and it will create a new layer on top of your already-existing pattern. Drag the layer around with your finger until it’s where you’d like it to be, and then press the big checkmark button at the bottom of the screen to finalize the effect. Lastly, it’s time to add our final detail—the beautiful crane! 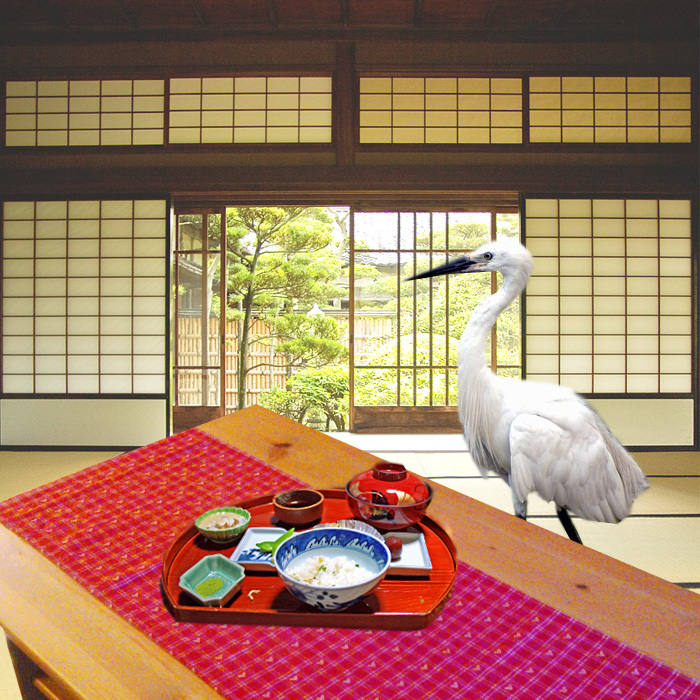 It may help you to look at a photo of a crane as reference when drawing. You can draw your crane in whatever pose you like, but we chose a flying pose with its wings outstretched. 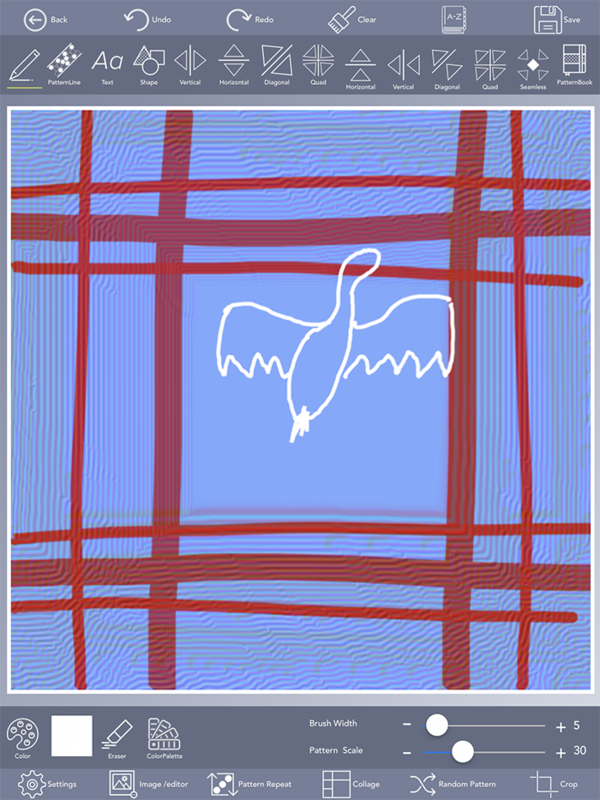 Change your brush color to white, and using a small brush—about 3 – 5 pixels wide—draw the outline of the bird, including a small pointed tuft for the tail and its wings. Then, fill in your basic bird shape with white. You may adjust your brush size to be bigger or smaller for this part, depending on your preference. Now let’s add some small details to the bird. What sort of markings you’d like on your crane is up to you! 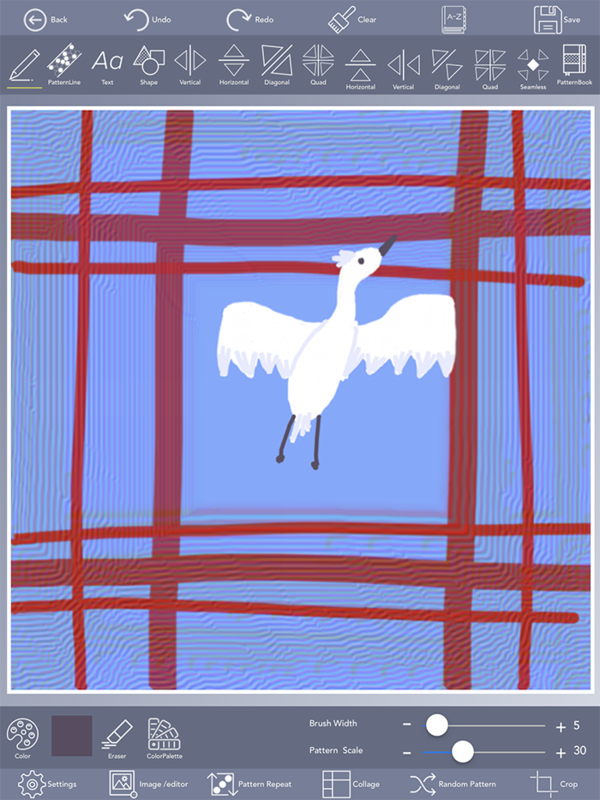 For our design, we used a very pale light blue as shading on the tail, tips of the wing, a tuft of feathers for the crown on the head, and shadow on the underbelly of the crane. For the eyes and feet, we used a dark brown color. When you’re finished and satisfied with your design, it’s time to repeat the pattern. 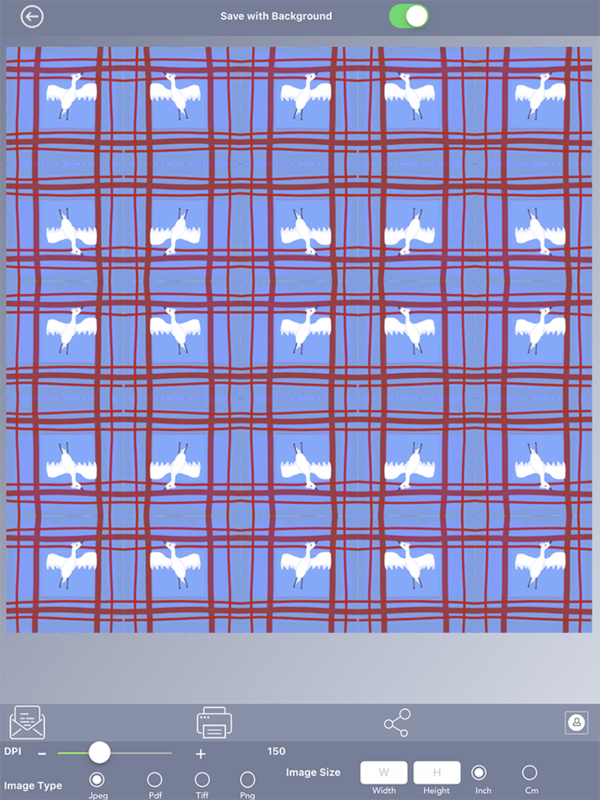 Press the ‘pattern repeat’ button at the bottom of the screen to begin. On this screen, you can repeat your pattern as many times as you like, adjust the orientation, etc. For this project, we suggest repeating the pattern 4-5 times. Use the slider bar at the top of the screen to repeat the pattern as many times as needed. You’ll also need to re-arrange the orientation of the quadrants so that the stripes connect themselves—you can do this by sliding the letter ‘R’ buttons at the bottom of the screen. Experiment with different quadrant placements and see what you like best. You can reference our image below to see how we arranged our pattern. When you’re happy with your design, it’s time to save it! Hit the ‘Save’ button and save your pattern to ‘Final Designs’. Select the ‘Final Design’ option that’s available underneath your saved designs on the ‘My Projects’ screen. Select your Design and choose Export which will take you to screen below. The dimensions of the file doesn’t matter, but the DPI must be 150, which you can alter accordingly on this screen. Email the file to your computer or device where you plan to order the wallpaper from our chosen maker, in either a TIF, JPEG, or PNG file. 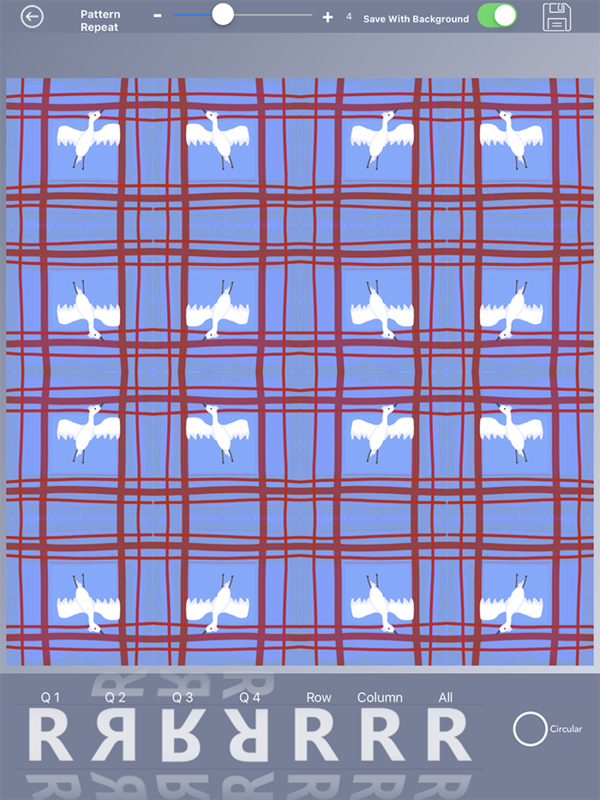 This month we’ve selected Spoonflower to print our custom fabric! The ordering process is simple—Log on to their website and go to the ‘Design’ section, where you will have the choice to upload designs for wallpaper or fabric. 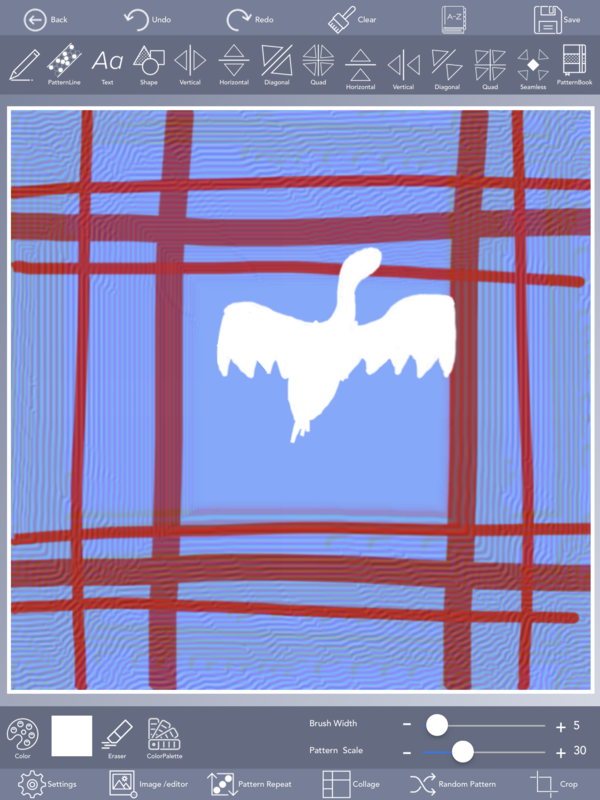 We’ll be ordering custom fabric, so select the appropriate option and upload your design. 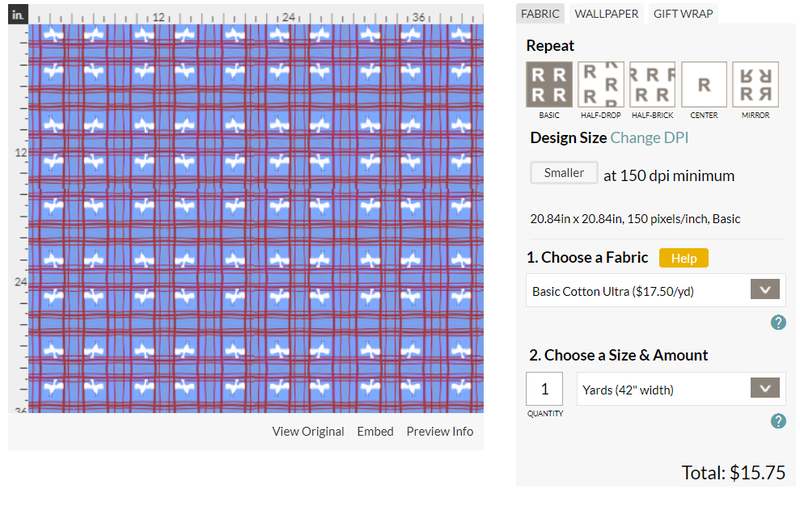 Use the drop-down menu options on the right of the screen to select what kind of fabric you’d like to order. For this project, we ordered 1 yard of the “Basic Cotton Ultra” fabric. Click the green “Add To Cart” button when you’ve completed your order, and finish your transaction. Your fabric should arrive about 1-2 weeks after ordering. Once you’ve acquired your fabric, it’s time to sew your one-of-a-kind tablerunner! All you need is some basic sewing skills, a sewing machine, thread, sewing pins, fabric scissors, and a hand-sewing needle. On top of your custom fabric, purchase some light-weight cotton batting to go inside your tablerunner. 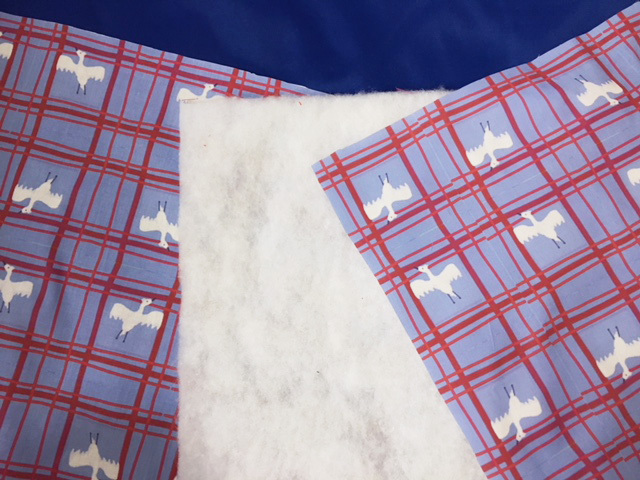 Start the process by folding your custom cotton fabric in half, making a crease in the middle, and cutting down the crease, so that you end up with two pieces. You may decide that you want your tablerunner to be thinner than the width of these pieces—we personally cut off about ~2 inches from the width of our pieces to make them a more appropriate size for a tablerunner. Then, roll out your cotton batting and trace one of your fabric pieces onto it, cutting out a piece of batting the same size as your fabric. Now, let’s start sewing! Take one piece of your printed fabric, and align it with the cotton batting. Pin the edges and sew around it with a ¼”seam. If you own a serger/overlock machine, you can use this to secure the edges—but if not, a single stitch from a regular sewing machine will do the job just fine. When you’re done, you’ll have your piece of cotton batting attached to the back of one of your fabric pieces. Now it’s time for the most important step—sewing the tablerunner together! Take your two fabric pieces and place them together, with right sides facing each other. 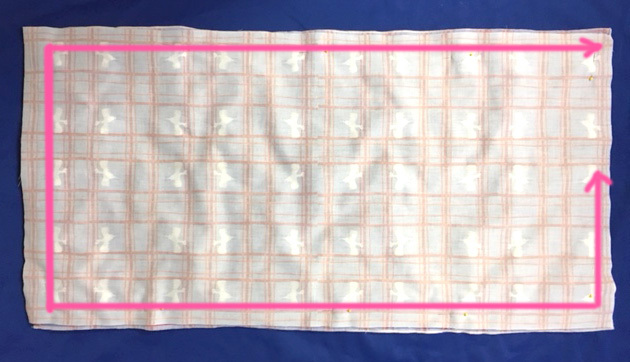 Pin the pieces together and sew around the tablerunner at a ½” seam allowance. Be sure to remember to leave a hole open on one of the short sides of the tablerunner! See our diagram above to get an idea of how much to sew. When you’ve finished, pull the fabric right-side out through the opening. Use a dull object like a knitting needle or something similar to help poke the corners out fully. Give it all a good press with an iron, and your tablerunner will almost be complete! Now all that’s left to do is close the hole! 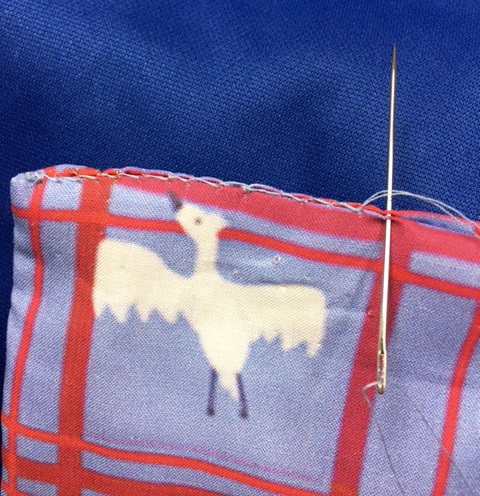 Using a hand-sewing needle and appropriate thread, carefully hand-stitch the hole closed. Use small stitches that just catch both sides of the fabric, so that it won’t be noticeable. Enjoy your one-of-a-kind tablrunner with your Genue design! The best way to understand Genue is to try it! Genue Inc. Copyright 2012 - 2019 All Rights Reserved.